The Art of Random Willy-Nillyness: How to Make a Prime Rib Roast! How to Make a Prime Rib Roast! It is our New Year tradition to stay at home. We rarely go out because we do not want to deal with the hassle and crazy people driving around. So I make a great meal of Prime Rib Roast, we watch movies and have champagne at midnight if either of us actually makes it to midnight. This year was no different. This year, I did mix it up. I made my delicious Potatoes and Onion Gratin instead of mashed potatoes but that was the only difference. I also made some asparagus and we had cheesecake for dessert. Yummy. 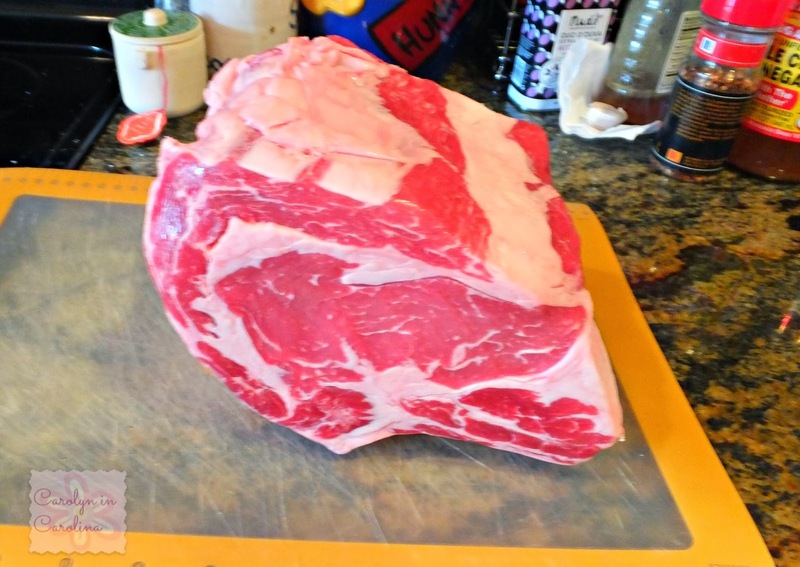 I do admit that a Prime Rib Roast is expensive. 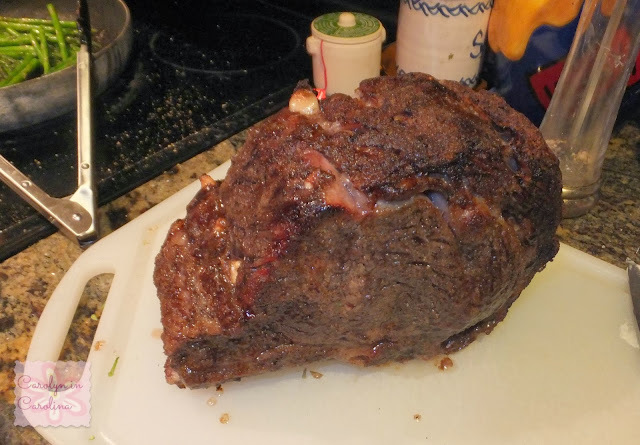 A two bone roast will cost around $50+ dollars and a three rib roast is about $75+ and so on. But, in reality, it is actually a deal. A two bone rib roast lasts us a couple of days. We have leftovers for at least 2 days. Besides, having another full meal, I make hash, tacos and stroganoff. If you have a family, a two rib roast will serve 5-6 people easily with sides. So when you break that down, you are only spending about $10-$12 per person for a very fancy meal. And it's easy to make. 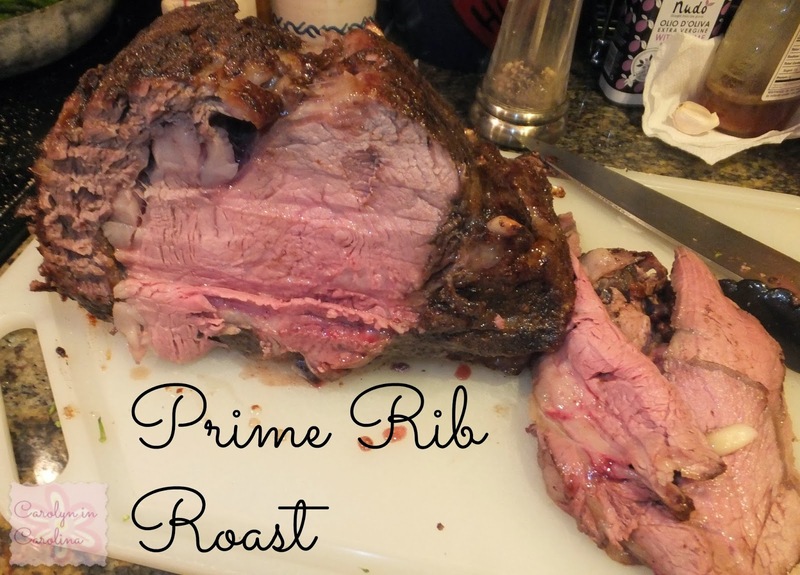 I know for the longest time I didn't want to touch a prime rib roast because I was clueless. And the first year I tried, I overcooked it. The second year, I made it too rare. 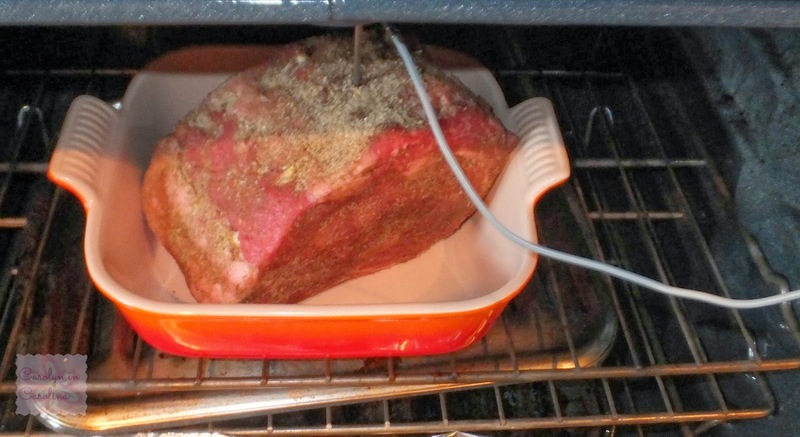 Ultimately, I started using a good meat thermometer and mastered the roast. You absolutely need a good meat thermometer. You want it to be medium rare to medium. If you let it go medium well or well done, you will have taken all the flavor out. For those squeamish about rare meat, remember the outside parts will be more well done. Anyway, here is my recipe. 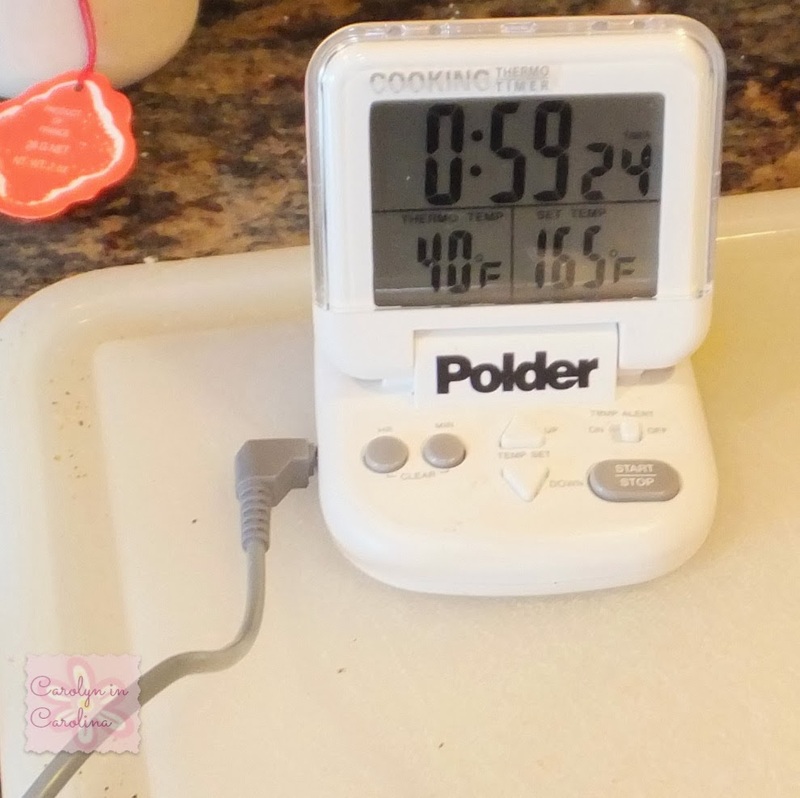 You can mix it up a little but if you follow the directions and get a good meat thermometer, you will have a wonderful meal for any special occasion. Start out with a good piece of meat. I had a two bone rib this year. Conventional wisdom says to age it in the fridge for a few days but I get squeamish about leaving meat in the fridge for days. So I actually take it out a few hours before cooking and wrap it in paper towels. I keep changing the paper towels every hour or so. You are drying it out. It will make the outside crispier. You want a good cap of fat on the meat. This meat did not have a good fat cap but it was the last one in the grocery store so beggars can't be choosy. 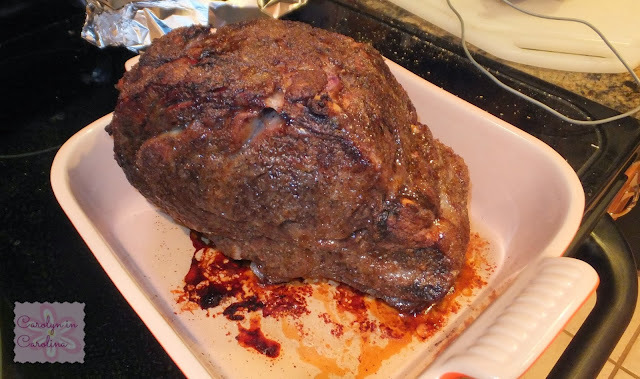 Take the roast out of the fridge an hour before cooking. You want the meat at room temperature. That is so when you toss the meat into a very hot oven, it doesn't freak out and shrivel up. 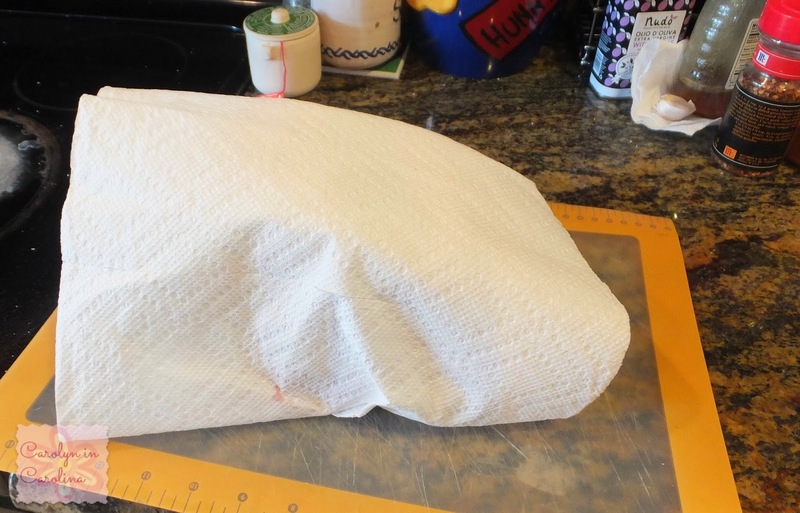 So keep it wrapped in paper towels and leave it out to get to room temperature. It won't go bad. 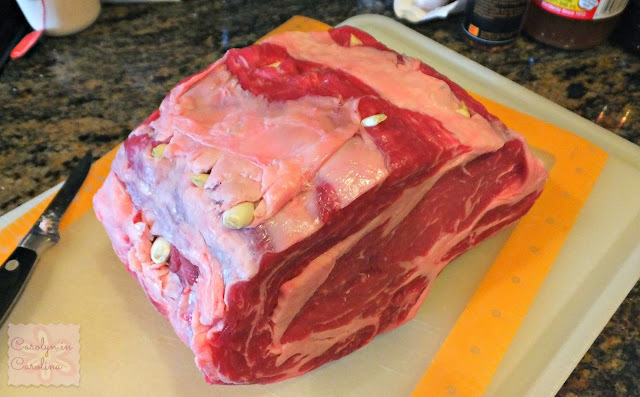 Once the meat is at room temperature, unwrap the rib roast and start cutting little slits into the top and the sides. Make the slits deep enough to stuff in a whole garlic clove. You can season the slit with salt and pepper and then slip in the clove. 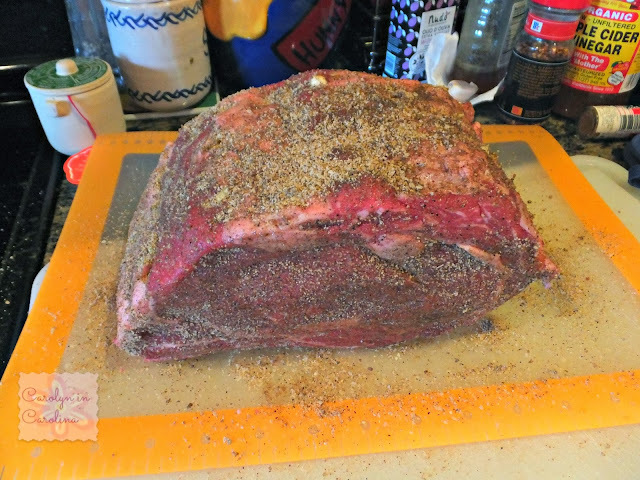 I usually add about 12 cloves depending on the size of the rib roast. Then season the roast. I use Penzey's Prime Rib Rub. This is the best thing ever!! I suggest going online and grabbing some of this rub. 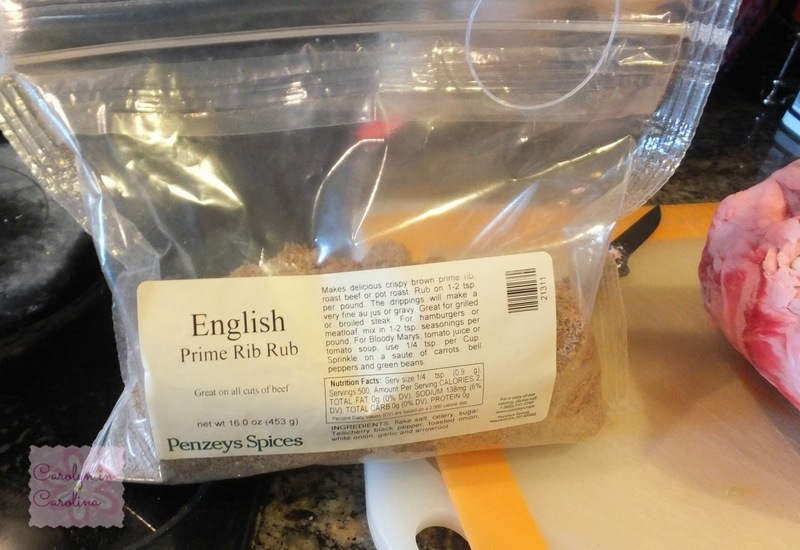 If you don't have it, you can make your own with a variety of spices or just salt and pepper the meat. But make sure you get seasoning everywhere on the roast. 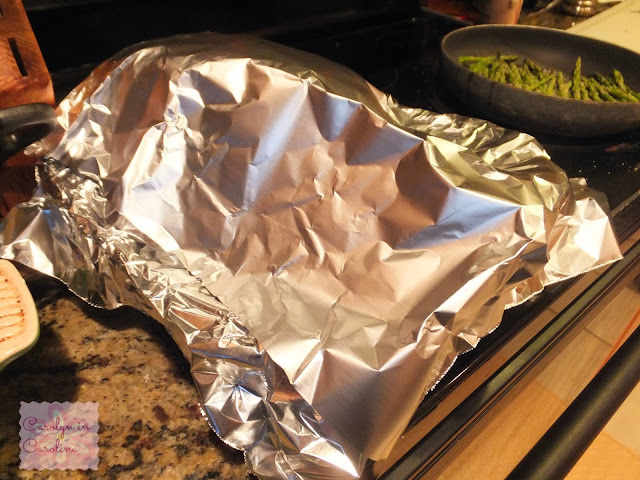 Put the roast into a baking dish and place into a 425 degree oven for 15 minutes. Then after 15 minutes turn the oven down to 325 degrees and cook. I cannot tell you how long because it will depend on the size of your roast. My two bone roast took about 2 hours. The only thing I can tell you is get a good meat thermometer. I know, I already said that but it will save your roast. For rare, you want the meat around 130 degrees, medium rare about 135 degrees, medium 140 degrees, medium well about 145 degrees. You DO NOT want to cook this piece of meat well done. It will ruin it. Now, go on the internets and double check the temperatures because I am sort of willy-nilly. But this is what worked for me on a two bone roast. Once the meat is done, take it out and tent it with foil and let it rest at least 15 minutes. I usually let it rest for about 20 minutes. It will continue "cooking" even after you take it out of the oven. Once it is rested, then you can slice it up and eat! It is actually quite an easy recipe. It is delicious! We had tons of leftovers and had a full meal the next day. We also had sandwiches and I made a delicious stroganoff. I think everyone should try and make this piece of meat. Once you actually master it, you will always make it. This looks absolutely delicious! For me, the hardest part would be spending the bucks to buy the roast in the first place. Now, may I make a request? Please post the recipe for your Potatoes and Onion Gratin! 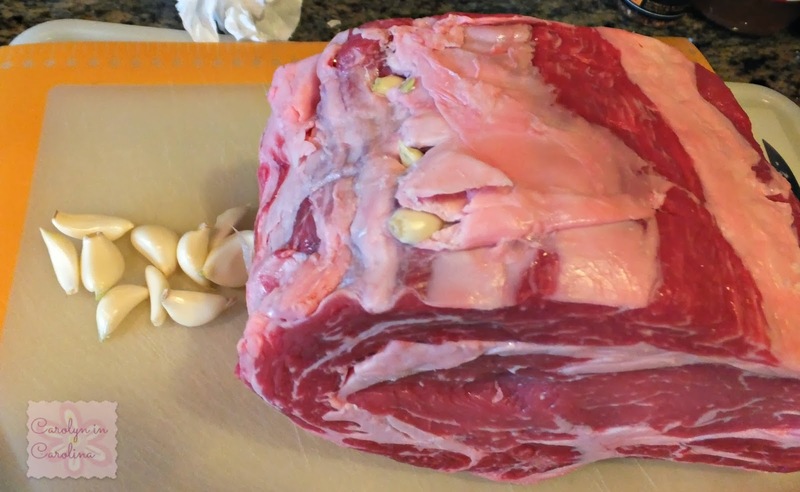 Thanks for the great step-by-step for how you made your roast, and for the encouragement to give it a try. Thank you for the tips. I would love to make one of these for my family and I have always been to scared I would mess it up. They are so expensive. I just pinned these instructions so I can follow them. I have a 17 lb. 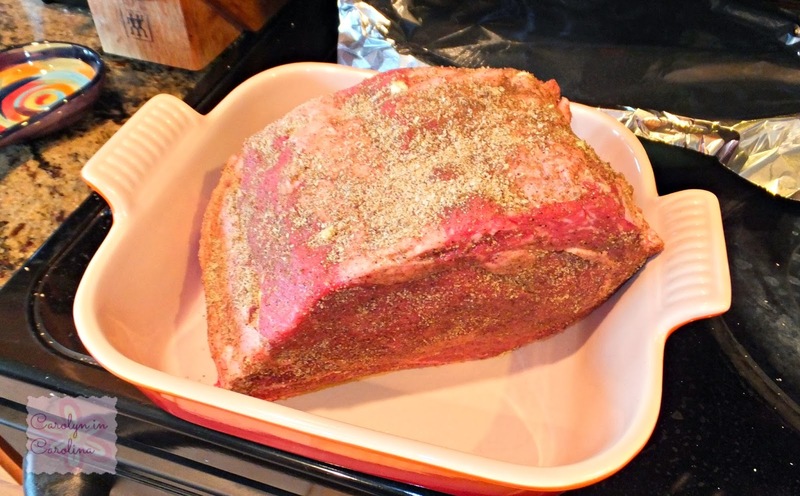 prime rib roast. Any idea how long that will have to cook? A guess? Going to make it tomorrow for 8 people. I would say to just use the thermometer. I would say that might take about 6 hours but I can't be sure. I have never made this before but it sure looks delicious. would love to try making it. That looks delicious! I am sure you had a lot of leftovers too! Thank you for sharing. 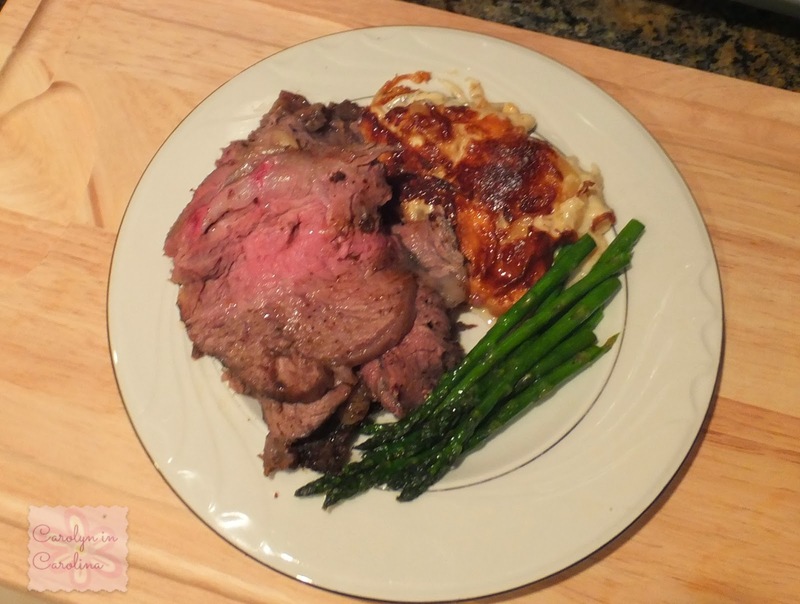 I think prime rib roast is such a classy meal to serve for guests. It is delicious if done right. I have never made one myself, only ever helped my family serve one at holidays. May need to make one if I find a piece on sale. We use tons of garlic also, and lots of seasoning, I love the way your turned out, leftovers are good for making sandwiches. OMG! That looks amazing...my mouth is watering! I have never made one before and though I might have to take a loan out to buy one, this New Years I want one for my husband and I! 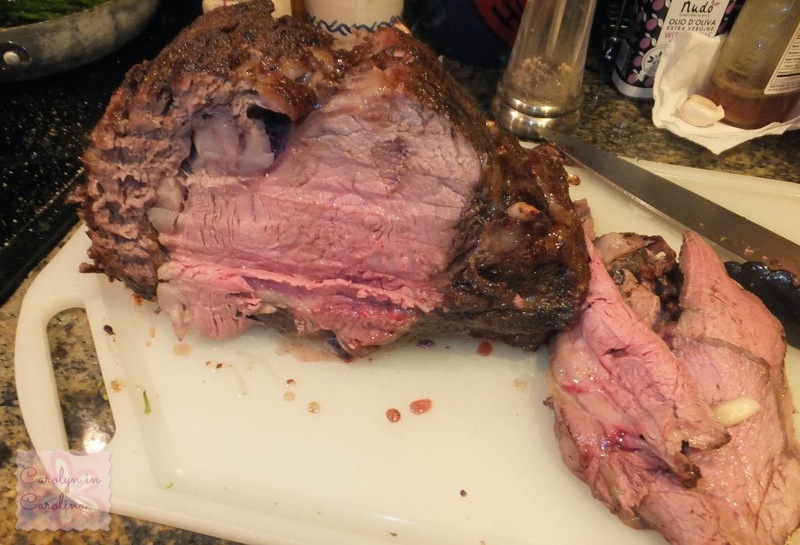 I've never made a prime rib roast. This looks soo good, and these are the best directions I've ever seen. It gives me the courage to try it, that it will come out good, and not burnt to a crisp. Big Fish Games Giveaway! Win a $25 iTunes card. Big Game Treats and Recipes! Join Purex in Supporting Make-A-Wish + GIVEAWAY! P&G and Walgreens #onmyway2fab Giveaway!! Chamin made my Holidays easier! Krusteaz Review and Giveaway! Baking Made Easier! New York Style "Thing to Bring" Hostess Kit!